Gorgeous! I can taste those sweet kernels. 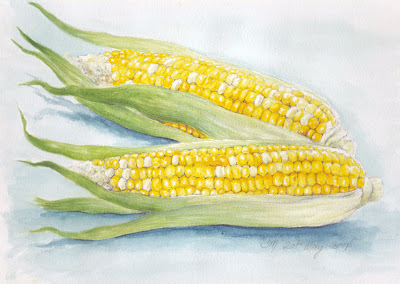 LOVE these corns, the colors are so perfect... great painting! Lovely corn sketch! All your food looks great! Thanks for stopping by my 100 dogs and EDinMay blog posts. 11 more days!! Amazing. You have really captured the freshness of these corn. Feta salad below was great too. What a fantastic drawing, Debra! Love your series of "Everyday matters"
Its a treat to see your work each day !!! I've been away, so am catching up on all your amazing drawings. You must be a very patient person to draw all those kernels of corn. But these look delicious and sweet.